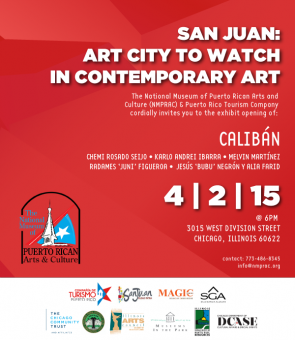 NMPRAC is pleased to inaugurate the exhibition, Calibán; artists Chemi Rosado Seijo, Karlo-Andrei Ibarra, Melvin Martínez, Radamés ‘Juni’ Figueroa, Jesús ‘Bubu’ Negrón and Alia Farid this Thursday, April 2, 2015 at 6 pm. 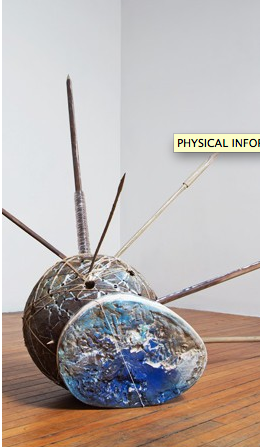 The exhibition brings together a group of renowned contemporary Puerto Rican artists featured in the publication, Art Cities of the Future: 21st Century Avant-Gardes of Phaidon Press, which positions to San Juan of Puerto Rico among the twelve cities avant-garde in contemporary art worldwide. 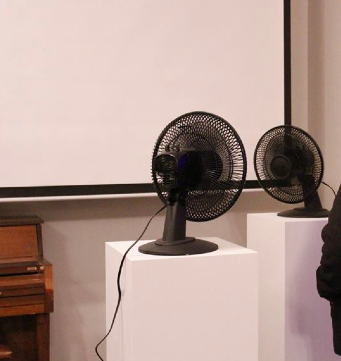 On March 26th, the Gene Siskel Film Center held the screening and artist Q + A program of the South Korea–born and Cambridge-based artist Soon-Mi Yoo’s newest work Songs from the North. Songs from the North is a one hour long experimental documentary that attempts to look at the current political and living situation of North Korea by presenting a collection of mostly personal travel footage over the course of four years and three visits, with the found media footage of North Korean Television, theater performance, and drama, and interviews she has with Yoo’s father who had a close relationship to the civil war between the North and South Korea. Unlike many other films that are made about the North Korea’s history of oppression and censorship that turns to make a strong political point, Yoo’s film focused her lenses more on the ordinary life of the North Korean individuals she was allowed to have contact through her guided touring experience when she traveled in the country. “Hoping to understand how they could live in such a tough condition, I am interested in the human spirit and what may sustain their way of living.” Says Yoo during the Q + A session after the screening. 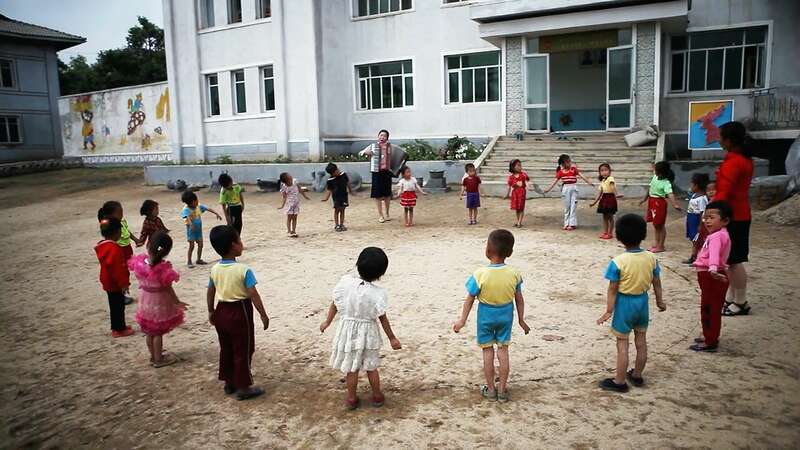 Handling editing and camera duties to the found media footage as her own, Yoo re-contextualized the cold nature of North Korea’s government-mandated image by getting intimate with its ramifications. 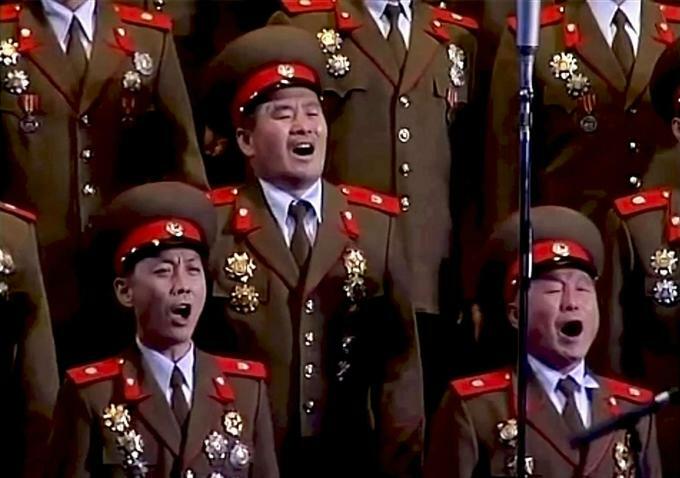 Yoo digs deep into the paradoxes of North Korea through its own images of the former leader Kim Il-sung and the myth like emotions that the performers was able to put on when singing the wartime song “Nostalgia”. Songs from the North takes on a personal but yet hunting transcendent look at the propaganda in North Korea and function as a cry to the souls of the North Korean people’s condition. Closer Still considers the reciprocity between form and content, exploring the possibilities of the binary. The symbolic enters the narrative within each artist’s process, bringing two visible aspects to an intermediate point where ambiguity and truth reach a place of both/and – the things seen and those unseen. Through photographic material, and coded representations of familiar imagery, a third hidden term counters dualistic consciousness. New works by the artists’ presented in this exhibition arrive at a site of spatial hyphenation connecting subject and object, rhythm and repetition, and the affect of language and thought as modes of communicative accuracy. The Nightingale is delighted to introduce FOLLOW FOCUS- a new process-oriented screening series that rallies audiences and resources behind a moving image maker as they complete a feature project. Designed to expand viewership into the production stage, FOLLOW FOCUS invites audiences to observe a director’s process, collaborations, and inspiration. Our inaugural featured project is THE LADIES ALMANACK written and directed by Chicago-based filmmaker, Daviel Shy and produced by NYC-based performer, Stephanie Acosta. THE LADIES ALMANACK is a feature-­length experimental narrative film shot on Super 8 and based on the novel of the same title by Djuna Barnes. The film is a kaleidoscopic tribute to women’s writing through the friendships, jealousies, flirtations and publishing woes of authors and artists in 1920’s Paris. The Nightingale will host a total of 4 screenings during the course of the film’s production, each one in a different season and highlighting a different element of the process ending with a rough cut screening in Fall of 2015. The production of a commissioned art object will also raise funds for the film. Admission price at each of the four screenings includes part of a limited edition, risograph-printed Ladies Almanack Tarot Deck designed and illustrated by Jess LeMaster. Attend all four screenings for a complete 24-card set. The Spring Screening will include moving image work by cast and crew members of the movie, including work by Stephanie Acosta, and Fannie Sosa & Poussy Draama. Party to celebrate The Nightingale’s 7th birthday to follow the screening. Special Thanks to HOMEROOM for program support of this event! To support the THE LADIES ALMANACK right away, check out the movie’s website. Donations are tax-deductible. 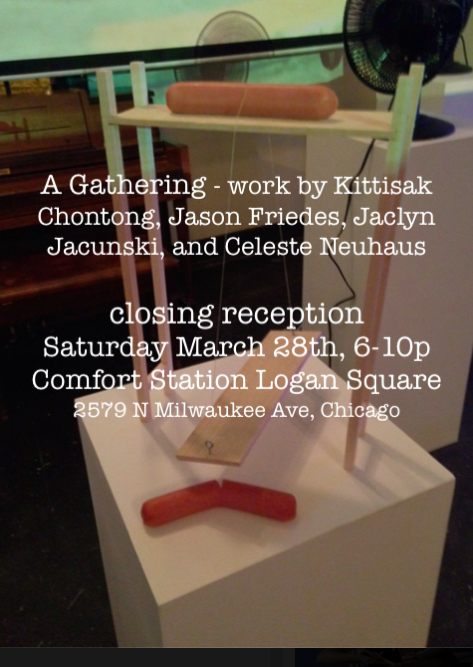 A Gathering at Comfort Station presents works by Kittisak Chontong, Jason Friedes, Jaclyn Jacunski, and Celeste Neuhaus. The show is framed by the curator as “a gathering”; the exhibition writing suggests this holds the group of works together not as an applied theme, but rather as an invitation to the visitor to gather with these artists and artworks. The exhibition press release claims the gathering framework allows visitors to weave their own series of connections and disconnections. Unfortunately, the disconnections are far more apparent than connections. The work by the four artists is not tied together by style, subject matter, or medium. At best the work is tied together by the way the viewer approaches each work—their ability to gather around it physically for viewing and as a central point of conversation. The artist whose work demonstrates this the best is Kittisak Chontong. His pieces are presented on pedestals as riddles. They are a series of interactions, what-ifs, and mis-haps yet to be happened. 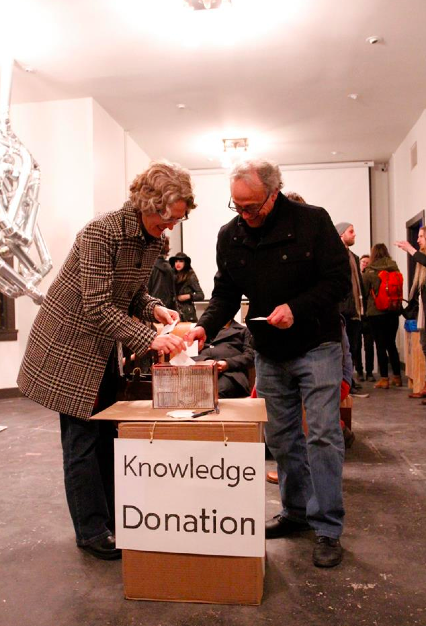 One of his pieces is a large donation box asking for knowledge, which creates chitchat among visitors and reason to gather around the box. His hot-dog guillotine piece produces fear and humor. The small wooden piece with the tac is a puzzle ready to solve, allowing the viewer to insert something in the space from their imagination—a balloon or a tomato perhaps. One piece falls flat however—the set of two fans oscillating with a thin string tied between the two. As the fans move from side to side in apposing rhythms, the string is loosened and then tightened. It seems like the intent is to suggest the “almost” snapping of the string, but this affect is not achieved. It remains just a string tied between two fans without any anticipation or confusion created. The other pieces in the show do little to create connections. The sculpture by Jaclyn Jacunski, although formally interesting, really has nothing to do with a gathering or creating a gathering. Other than perhaps it is hung in a window where people could gather outside to see it. Although the artists have pieces that might be interesting in themselves, the curating led to confusion on why the works were being presented together. It is the artists connection to ACRE Residency is the only real thing that ties the work together. Last chance to catch SAIC MFA Painting & Drawing work by Kittisak Chontong at Comfort Station! A Gathering brings four 2014 ACRE residents together in the month of March to display new works created in the aftermath of their ACRE residency: Kittisak Chontong, Jason Friedes, Jaclyn Jacunski, and Celeste Neuhaus. These artists, none of whom were in residence at the same time, represent the wide scope of ACRE residents, each exploring vastly different topics through diverse material and performative practices. Whenever works are juxtaposed in a space, connections and threads begin to loosely form and un-form. Artist Lorraine Leeson once put forth that a definition of art might be the “gathering of ideas, people, or things together and holding them together for awhile.” This act of gathering can be found within many of the works presented in this exhibition. However, rather than establishing “gathering” as the applied theme though, it serves more as an invitation: as a visitor, you are invited to gather with these artists and art works, taking them each in individually and weaving your own series of connections or disconnections. Chicago Design Museum Portfolio Review Night is Back! Bring up to three current design projects and get feedback from some of the best local designers. Projects-in-progress and process work are strongly encouraged. Leave your tie and dress shoes at home; this is a casual event. Johalla Projects presents A l’ouest, its first solo exhibition of work by the Chicago-based artist Marzena Abrahamik. Showing a new series of photographs that considers her intimacy with friends, Abrahamik delves into different, increasingly refined parameters for making that mark a departure from earlier bodies of work that have focused on more marginalized communities. The exhibition opened on March 13 and will run through April 12, 2015. In a wide context, A l’ouest constructs a photographic world without origin or end. All loosely autobiographical in their conception, each of Abrahamik’s images evoke more complex themes that include feminine identity and representation, collaboration between sitter and artist, and interpersonal communication. Each photograph included in the exhibition, in meandering succession, is the result and complement of its connection to the other photographs and their subjects. Simultaneously engineered and organic, they are not always immediately truthful, as Abrahamik intends to point to the broader characteristics of the group of subjects that emerge from the scenes she is simultaneously fashioning and illustrating. Contact inf0@johallaprojects.com to inquire about open hours or schedule an appointment. A l’ouest does indeed meander. Landscapes alternately impressive in their scope or immediate in their intimacy transition to highly stylized and posed still lifes and group portraits. Abrahamik’s skill and care in her image-making is undeniable. A surprising number of works were included for a space of this size and the effect is one of saturation. Her photography, already vivid in its palette, is inescapable in Johalla Project’s space. It is both impossible to ignore the through lines weaving across the space, pushing against and cleaving to a myriad of narratives, or avoid falling headfirst into each large-scale tableau. The structural organization of her photographs, akin to an editorial sensibility, are directly discernible yet organic in the fluidity of their composition. Johalla’s presentation is at once a visual pleasure but a feat to undertake. For such a small space it takes more than one go around. Next Tuesday evening, 3/24, the Chicago Design Museum in collaboration with AIGA Chicago and the Society of Typographic Arts will be presenting “An Evening with John Massey,” a book release event at the Arts Club of Chicago to honor a Chicago graphic design legend. John Massey is a design legend at the forefront of the modernist movement in American design. He is an AIGA medalist and was director of design and corporate communications at the Container Corporation of America from 1964 to 1983 and research professor emeritus of graphic design at the University of Illinois at Chicago, where he taught from 1984 to 2000. This event will launch Vision, the definitive volume on his life’s work, which will be available exclusively and for the first time at this event. In addition, guests will enjoy cocktails and hors d’oeuvres. The event culminates in an interview with Massey by noted design historian Victor Margolin, followed by a panel discussion including Zoë Ryan, Curator of Design and Architecture at the Art Institute of Chicago, Marcia Lausen, Director of the School of Design at UIC, and Bart Crosby, President of Crosby Associates. Ticket for the evening are available for purchase on Eventbrite, and more information is also available on the event’s Facebook page.